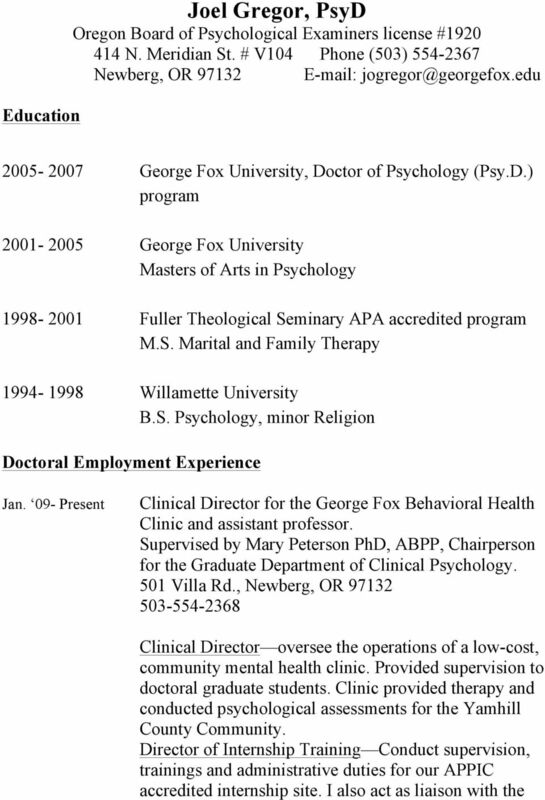 Download "2005-2007 George Fox University, Doctor of Psychology (Psy.D.) program"
2 various agencies and supervisors connected with the internship program. Assistant Professor provide 13 hours of academic credit hours to doctoral graduate students. Courses most commonly taught are: Social Psychology, Geropsychology and Advanced Couples and Family Therapy. 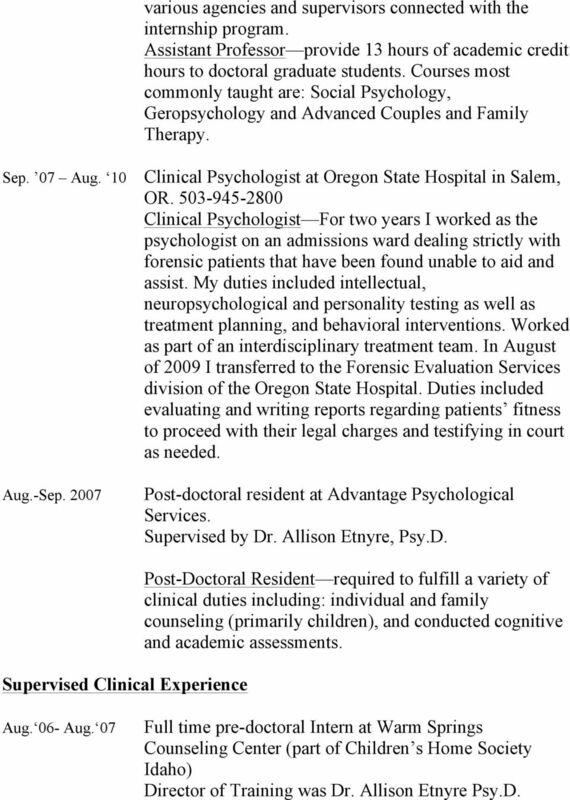 Sep. 07 Aug. 10 Clinical Psychologist at Oregon State Hospital in Salem, OR Clinical Psychologist For two years I worked as the psychologist on an admissions ward dealing strictly with forensic patients that have been found unable to aid and assist. My duties included intellectual, neuropsychological and personality testing as well as treatment planning, and behavioral interventions. Worked as part of an interdisciplinary treatment team. 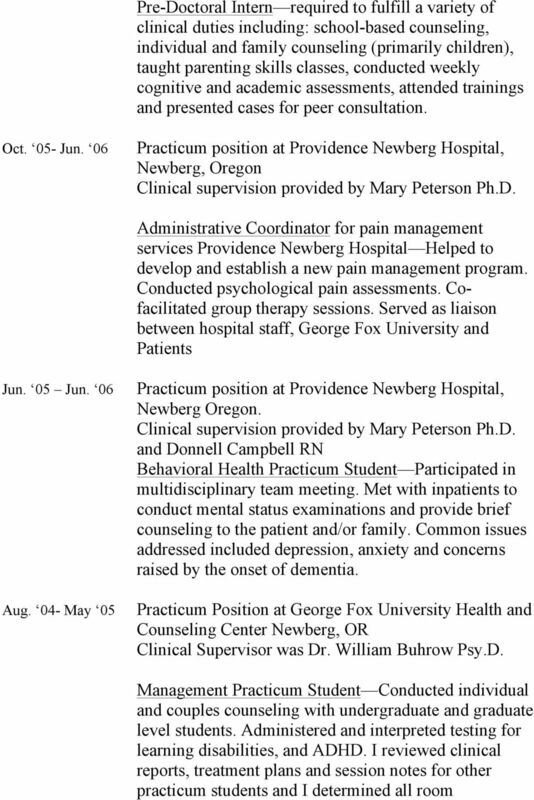 In August of 2009 I transferred to the Forensic Evaluation Services division of the Oregon State Hospital. Duties included evaluating and writing reports regarding patients fitness to proceed with their legal charges and testifying in court as needed. 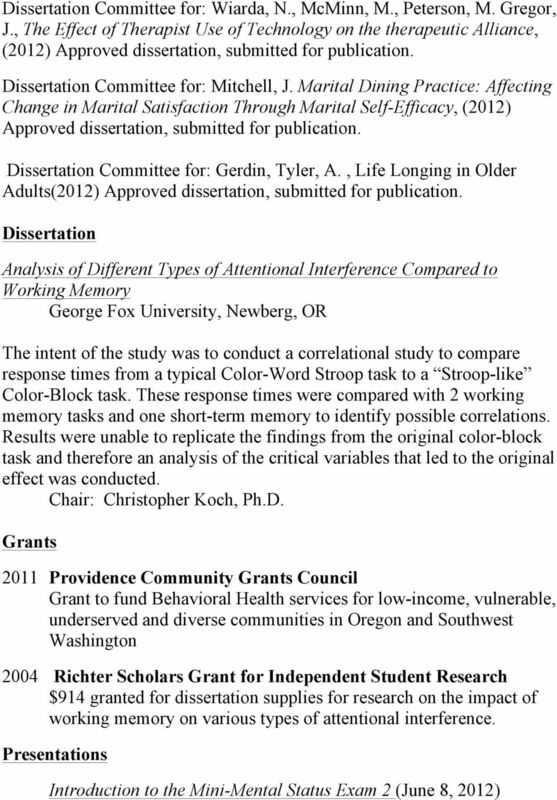 Aug.-Sep Post-doctoral resident at Advantage Psychological Services. Supervised by Dr. Allison Etnyre, Psy.D. Supervised Clinical Experience Post-Doctoral Resident required to fulfill a variety of clinical duties including: individual and family counseling (primarily children), and conducted cognitive and academic assessments. 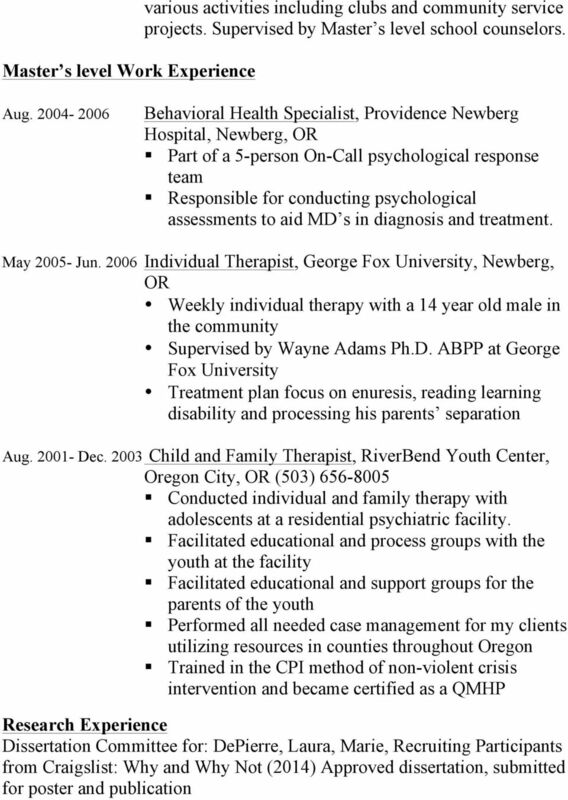 Aug. 06- Aug. 07 Full time pre-doctoral Intern at Warm Springs Counseling Center (part of Children s Home Society Idaho) Director of Training was Dr. Allison Etnyre Psy.D. 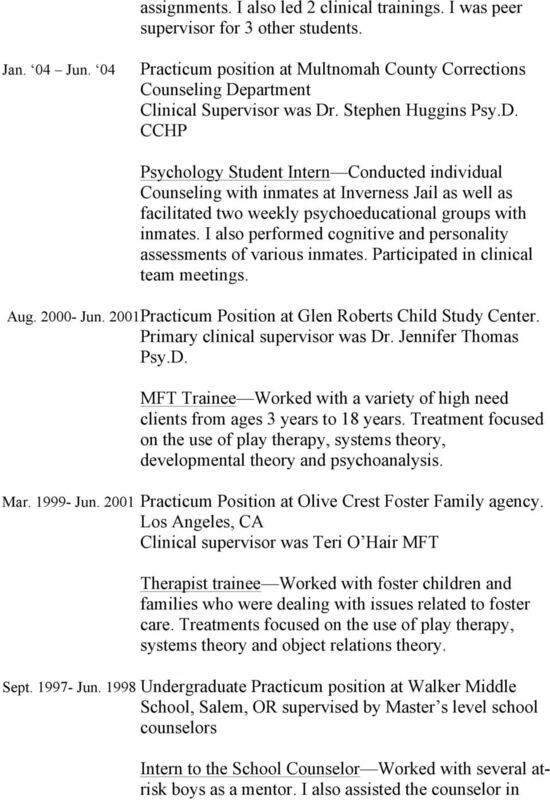 CURRICULUM VITAE HILARY COMBS EDUCATION 05/98 Ferkauf Graduate School of Psychology, Yeshiva University, Bronx, N.Y. 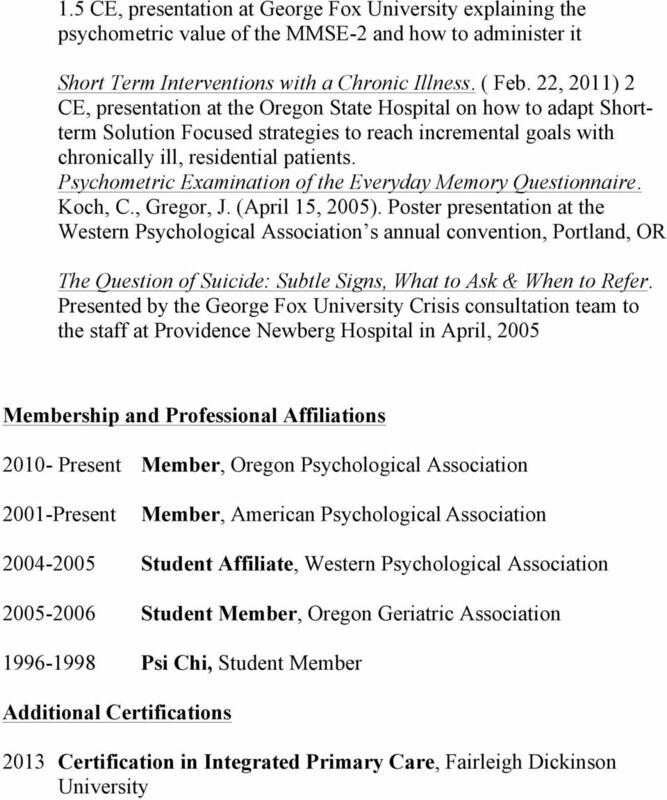 Psy.D., Clinical Psychology 05/90 Tufts University, Medford, MA. B.A. in Psychology. Apr. 2004-Dec. 2008. Over 200 CME s during the past five years. Meets Ingalls Hospital and state requirements for MD s within hospital settings. CARL DENNIS REDICK, Psy.D. CURRICULUM VITA ADDRESS: Western State Hospital Center for Forensic Services Program for Forensic Evaluations in Corrections and the Community C-18 9601 Steilacoom Blvd., S.W. CHRISTOPHER S. M. GRIMES, PSY.D. CHRISTOPHER S. M. GRIMES, PSY.D. St. Louis Behavioral Medicine Institute 1129 Macklind Ave St. Louis, MO 63110 EDUCATION Forest Institute of Professional Psychology, Springfield, Missouri Sept. 2000 Aug.
Ryan J. McGill, Ph.D., BCBA-D, NCSP, LSSP About the presenter What does a school psychologist do? Where do school psychologists work? Can school psychologists specialize? Is there a demand for school psychologists? WILLIAM M. BOYLIN, Ph.D. Individual, Marital and Family Psychotherapy 6 Way Road Middlefield, CT. 06455 Tel. (203) 349-7033 EDUCATION: Doctor of Philosophy in Clinical Psychology Heed University, Florida. Marsha A. Green, Psy.D. 14780 SW Osprey Drive, Suite 285 Beaverton, OR 97007 503-308-4251 (phone) 503-591-8628 (fax) drmarsha@opalinstitute. CURRICULUM VITA. M.A., Clinical Psychology, May 1991 Graduate School of Education and Psychology Pepperdine University, Malibu, California GPA: 3. RESUME. Jennifer A. Fleeman, Psy.D.